Weight Watchers is a great program to join for anyone who is looking to lose weight. It allows you to still eat the foods you love, in a very easy to use program. Below are 15 Weight Watcher approved slow cooker recipes you might want to try out to help keep you on track all season long. Planning out your meals helps your Weight Watchers journey be a little bit easier and adds variety to your meals. You will find a variety of soup recipes, chicken and beef recipes below. These recipes are going to fill you up and leave you satisfied, and have your families stamp of approval, all while making sure you dont spend all day in the kitchen! Chunky Tomato Soup| A Moms Take: Tomato soup on a chilly day always hits the spot. This recipe is so easy to whip up and will bring you the ultimate comfort food! Vegetarian Three Bean Chili| Tammilee Tips: This is a meatless chili that is sure to please a crowd! This is such a simple dish, you open up some cans, toss in the crock pot and leave it to marinade those flavors! You will have a flavorful chili at the end of the day! Low Carb Chili with Meat| Wholesome Yum: This is a bean free chili that is paleo and low-carb! 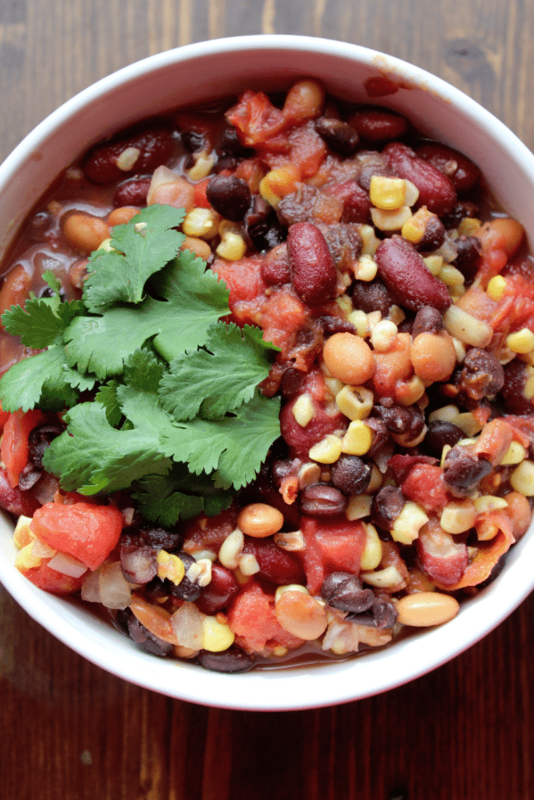 It is very hearty and a tasty twist on a classic meat and bean chili! Skinny Slow Cooker Broccoli Cheese Soup| Mom Endeavors: I absolutely love broccoli cheese soup on a winter day! It is so hearty and really warms you up from the inside! This recipe uses frozen broccoli and cauliflower, making the prep work that much simpler! Potato Soup| Having Fun Saving: You use canned potatoes to make this soup very fast to prep, takes around five minutes! This is great for those mornings you are heading out and don’t have a ton of time to prepare! Chicken Fajitas| Plum Crazy About Coupons: A very simple way to create chicken fajitas for your taco Tuesday night! Toss in your ingredients and let it do its magic, and then shred chicken and toss in a tortilla shell, add your favorite toppings and dinner is served! 3 Ingredient Hawaiian Chicken| Penny Pincher Jenny: One flavor packed dish that is very affordable to make! Serve with rice, quinoa or eat just alone! This is a tasty dish, that pretty much requires no prep work! Chicken Gyros with Tzatziki Sauce| Must Have Mom: This recipe is nothing but delicious and simple to make! Toss in your chicken and let it cook, and create a simple tzatziki sauce to top your gyros! This dish looks like you slaved all day, and even your kids will enjoy them! Slow Cooker Thai Chicken Lettuce Wraps| Mom Endeavors: Lettuce wraps are so fun and give a whole new twist and flavor to a dish! I love the crisp texture from the lettuce, makes these a very light and refreshing meal! Slow Cooker Chicken Parmesan| Emily Bites: Craving Italian? This is one perfect dish to serve up, for the whole family to enjoy! I love the flavor of chicken in a nice and flavorful tomato sauce, topped with parmesan! You can’t go wrong! 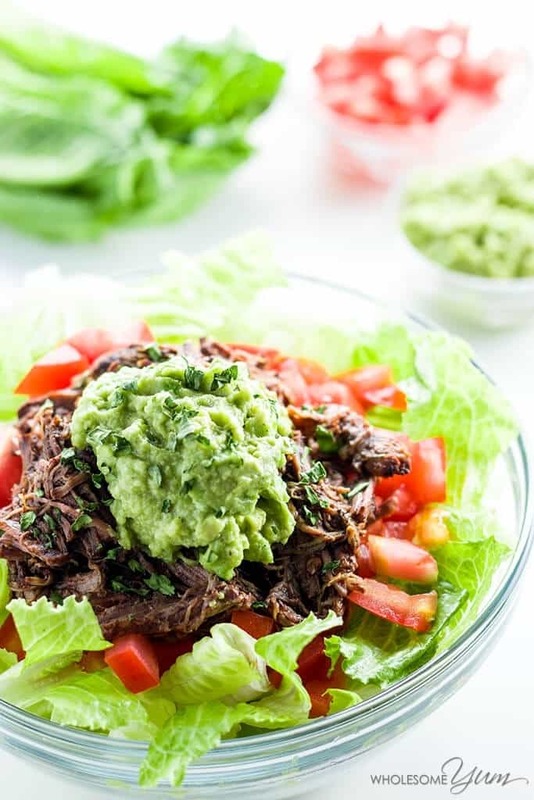 Chipotle Barbacoa| Wholesome Yum: This is a copycat recipe to Chipotle Barbacoa recipe, and you only use 10 ingredients. It is great for topping a salad and adding your favorite toppings like fresh avocado, tomatoes, shredded cheese, and can’t forget a dollop of sour cream. Crockpot Italian Beef| Crockpot Ladies: Another delicious Weight Watchers approved recipe for you to try out! This is a very moist roast with a zesty Italian seasoning and peppers! Crockpot Shredded Beef Chimichanga| Crockpot Ladies: This is a very healthy version to a chimichanga, that is cooked in your crockpot instead of being fried! It still offers that perfect flavor you are wanting, and is perfect for the whole family! Beef and Broccoli| LaaLoosh: I love the flavors of beef and broccoli, and this crock pot version is a winner! This is a traditional Chinese dish that many rave about! Try this new way of cooking it at home, using your slow cooker! Sloppy Joes| Slender Kitchen: Who knew you could make sloppy joes in the crock pot?! Perfect dish to toss in the slow cooker and head out for the day, to come home to supper ready! Pair with some fresh vegetables or even a side salad and dinner is served!